Hope I’m lucky to win these ! Either of these would be a welcome addition to my music library. As have always been a big Jazzing About fan , as finds it inspires so many pupils would love to win this and to discover a new music book , with MindfulNess which would appeal to a lot of my older returners as well as the younger students. These look like the sort of motivating pieces I would be delighted to introduce to my students. It would be great to win these lovely books! Minfulness is what I need! Didnt realise GCSEs would be so stressful – particularly when you are not sitting them yourself! 3 boys close together in age what was I thinking? GCSE’s and A levels for next 5 years! So please bring me some calm. Would love to win these for the summer please!! Totally intrigued by the Mindfulness collection for myself as I am currently practicing to be mindful. 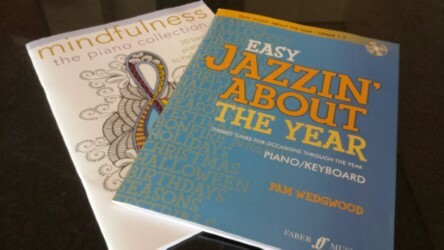 Love Pam Wedgwood and Jazz so this would be a fantastic collection to add to my studio. I’m really courious about these books! Both books sound fab and I know would be big hits with my students. I would love to win these for my library!! Thank you for the opportunity! I would love to see both books. Would love to win either or both books. They both sound perfect for what I need this summer. Thanks for the opportunity. ‘Mindfulness’ is at the top of my wish list, as a gift to myself more than anything, and I will be adding Pam’s new book to my collection as a matter of course – but how lovely it would be to win them both…! I would love to be the lucky winner! These books sound wonderful and perfect for this summer! If it’s from Pam Wedgewood it is bound to be good and mindfulness sounds great. both of these books look like awesome additions to my student rep list! Hi Melanie, I really enjoy your weekend competition freebies. The Jazzin’ About caught my eye. It would be great to win it. I think it may be a useful series that I can benefit from knowing. Wish me luck. Take care. This would be a fun win! They both look great! Thanks for sharing them with us! These look like awesome books! Would surely love to have either of these! Keeping my fingers crossed! Fantastic. I’m currently looking at links between mindfulness practice and music. For example, using scales as a form of meditation? Or improvisation and learning using mindfulness techniques? Would love these! I’d love to win Jazzin’ About and inspire my students with something a little different. Mindfulness sounds like a beautiful collection. Would love to win these. They look like it’ll be a lot of fun to get into. Would love to win these not sure if my last post was received. They look like fun to get into. Both books will be great addition to my piano library. They both look brilliant! I like the Jazzin’ About books and the Mindfulness one looks really interesting too. Everything you do is fantastic so I would welcome these additions to my library. I wasn’t going to enter, as I was lucky to win a book a couple of weeks ago. However, I’ve given in to temptation! I think I’m passed any sort of Mindfulness so Jazzin’ About it has to be!! Both books look good. I’d love to win.